Thinking of having a party this weekend? The three key ingredients to a great party; good friends, good drinks and good food. 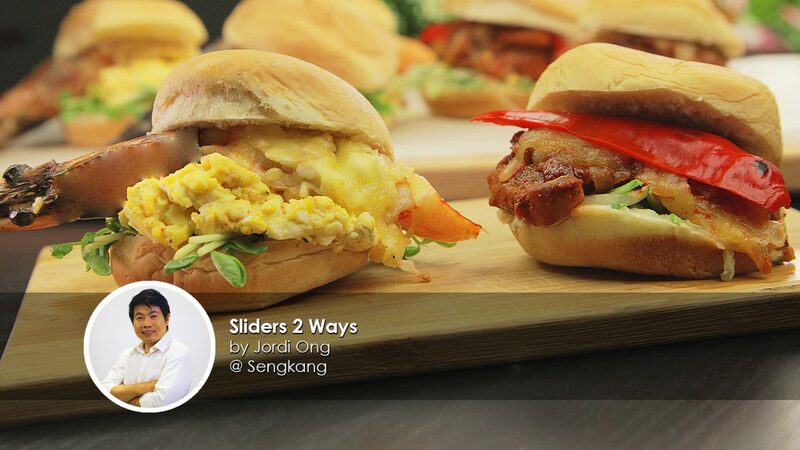 Today, our home cooks, Jordi Ong shares with us his very own Burger Sliders! First off, we have the Sambal Chilli Chicken Slider. 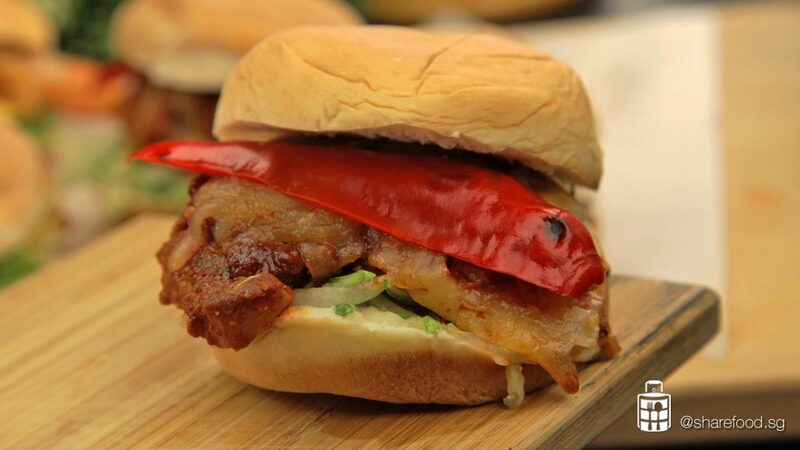 The Sambal Chilli Chicken Slider was inspired by Jordi's dad who loved having spicy sambal chicken with plain rice. When Jordi was younger, his dad used to cook a huge chicken leg along with some sambal chilli for him. This simple yet flavourful dish has always brought back memories from his childhood days. 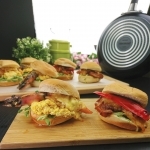 Just for this period (Sept-Oct 2017), Jordi is selling his Sambal Chilli Chicken Slider @ https://www.sharefood.sg/product/sambal-chili-chicken/ - check it out here! *Unfortunately we have cease the sales as selling period is over! Next up, we have the XL Prawn Slider. The inspiration for the XL Prawn Slider came from the lobster salad dishes that are served at restaurants and wedding dinners. Lobster salad is considered a luxury - even when eaten on occasion - so to replicate the richness of the seafood dish, Jordi incorporated fresh giant shrimps and egg mayo to form an equally indulgent combination, thus giving rise to his XL Prawn Slider. 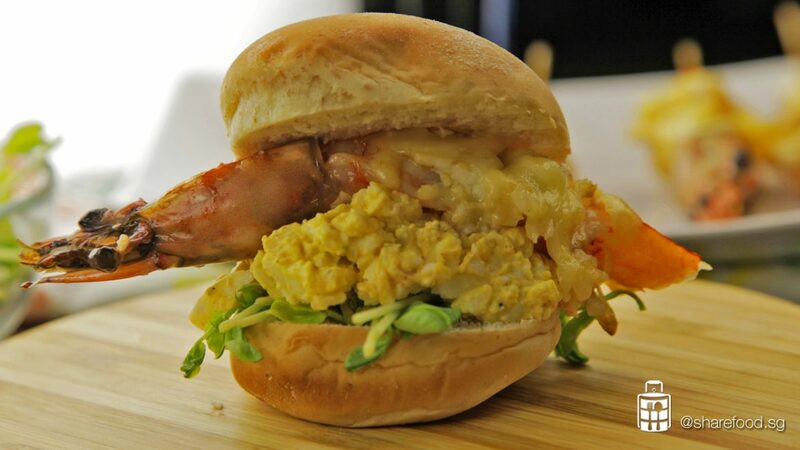 For just $31.60, get this tasty and juicy, XXL prawn burger @ https://www.sharefood.sg/product/butter-grilled-xl-prawn/ and Jordi will personally deliver it to you! Available right now during Sept-Oct 2017 only. 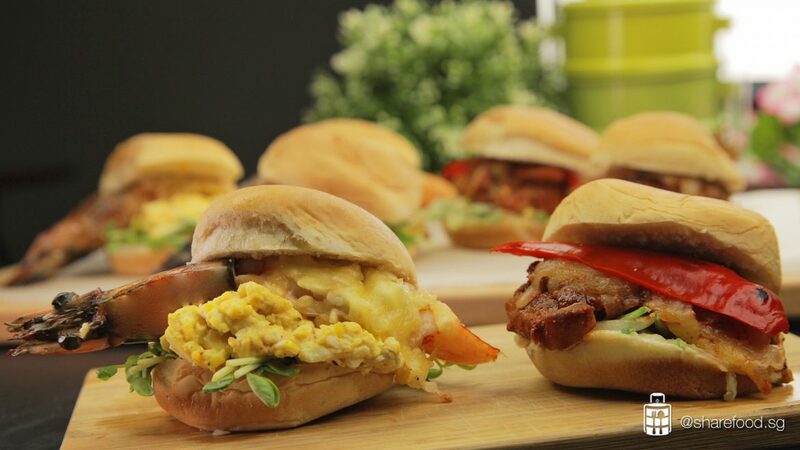 To avoid eating oily and greasy sliders, no cooking oil was used during the cooking process. This is made possible with the use of Circulon non-stick grill pan, which allow us to cook both dishes back to back effortlessly! In fact, if you are an avid Share Food fan, you would have notice that we have been using their non-stick pans for quite some time now! 2 red chilli deseed. Cut into 1/3 each. Grill to caramelize it. 60 g peashoots soak for 5 mins. Aside to let it dry out. Cut the chicken thigh into 40g – 55g portion. Slit the thick part of the meat to prevent uneven under-cooking. Marinate the chicken with salt, chilli powder and sambal chilli sauce. Mix evenly and allow it to marinate for at least 12 hrs in the chiller. In a saucepan, heat 1l water. Add in eggs and cooked it for 8 minutes. Drain the hot water and pour in tap water. The coolness from the water will remove the egg white from the shell which allows easy peeling. Mash the eggs, add in mayonnaise, salt and pepper. Mix well. Set aside in the chiller. Trim off prawn feelers, torns and the front legs. De-shell the prawn body, leave the head (optional) attached to the body. Use a satay stick and poke through the prawn from tail inwards through the body and the head. Silt open the prawn body top, remove the black tract. Be gentle with the prawn head, make sure it doesn't drop off. Preheat the oven at 230 degree Celsius. On a grill pan, grease with olive oil and heat it up using medium heat. Add in prawns. Lightly brush entire prawn with butter, worcestershire sauce, add chopped garlic and squeeze mayonnaise on the silt. 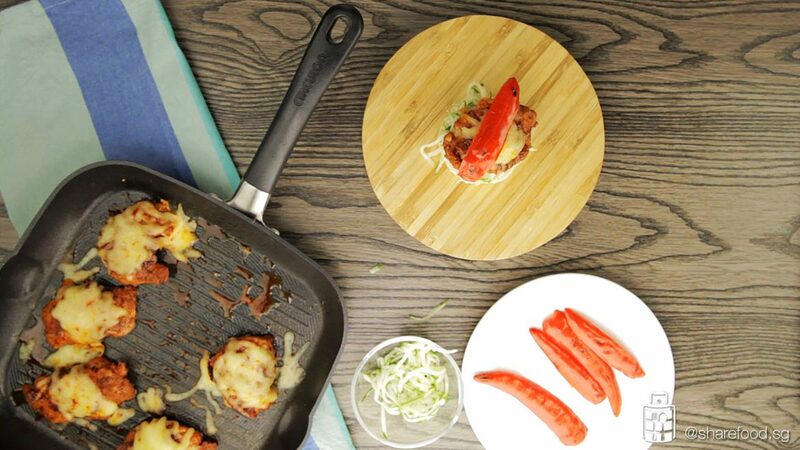 Grill 5 to 8 minutes. Once it’s almost cooked through, top with mozzarella cheese. Remove from heat once it’s cooked. Set aside. Clean the grill pan with a kitchen towel. Grease the pan with some olive oil. Add in the marinated chicken and grill for 4 minutes on each side. Turn off the heat, spread 1 tbsp of sambal chilli on each chicken steak. Top each steak with mozzarella cheese and transfer to the over to melt the cheese. Thinking of what’s cooking next door? Check out “Food Near Me” on Share Food mobile app to discover other amazing home cooked dishes near you!